Canada’s Food Guide- a welcome change. The new Canada’s Food Guide is a welcome change from the highly structured and restrictive days of it’s past. The new guide no longer looks to dictate your diet in perfect portions, but actually act as a guide. The eye-catching new plate diagram is a much easier portioning system to understand, and replaces the old (highly-industry influenced) rainbow. The main recommendation is simple: eat more plants. It isn’t about cutting out meat, dairy and grains, but simply shifting our portion sizes to have the focus be on vegetables and fruits. Cook more often: Cooking takes time, and if that is something you’re short on, try to carve out just a couple of times a week that you commit to cooking dinner- and get the whole family involved if possible! Make it fun by trying a new recipe (pro tip- head to the third floor of our new downtown Calgary Public Library and get out a cookbook to base a whole meal around), play music or listen to a podcast while you cook, or appoint one of the kids ‘head chef’ and allow them to choose the meal plan for the evening. Feeling uninspired? Come by our weekly Farmers’ Market on Wednesday to find some fresh ingredients or chat food with our awesome vendors. Eat meals with others: Host a potluck or dinner club with your friends and neighbours! Themes help make group meals easier- choose a culture to explore, have guests bring items that align with the theme, and play music from that country to create some great atmosphere! New to the neighbourhood or looking for a way to get to know some more folks in the area? Every Thursday at the HSCA from 6-8pm everyone is welcome at our Neighbour Night program where you can share in a vegetarian meal, and a fun activity. Additionally, the second Friday of every month we host a Community Potluck- all are welcome! Enjoy your food: It seems a bit basic, but when it comes to food- you should enjoy it! Eat what you like. But of course, try to keep the focus on plants! If you don’t like vegetables much, find at least one you do enjoy (at least a little bit!) and look up several different ways to prepare it. Cauliflower doesn’t always have to be steamed and bland… try it as a garlic mash, with chickpeas in a curry, or as cauliflower “chicken” wings. If you don’t enjoy what you’re eating, you’ll cook less, and depend more on processed and convenience foods. Eat local to improve flavour and nutritional value, and try new things! Variety is the spice of life after all. This classic winter recipe was made recently by loyal market go-er and YYC Growers harvest box subscriber, Lindsay Mogden. Using her box bounty, with some other key local ingredients, she created a luscious soup and paired it with bread from Prairie Mill and a side salad with her own beet and cabbage sauerkraut (using more YYC produce!). We love that Lindsay was able to create a well-balanced meal featuring so much "local deliciousness"! In a dutch oven, over medium-high heat, cook the bacon, then add the onion and leeks. Cook until tender (about 5 minutes). Add the garlic, cook a further 30 seconds. Add the potatoes and broth, and bring to a boil. Reduce the heat to medium, and let simmer until the potatoes are tender (about 10-15 mins). Stir in the pepper and the half & half. In a small bowl, mix the aioli ingredients and refrigerate. Preheat oven to 375°. In a small bowl, whisk marinade ingredients until blended. Place mushrooms in a 13x9-in. baking dish; drizzle with 1/4 cup marinade. Bake, covered, 35-40 minutes or until tender. Remove from baking dish; cool slightly. Cut into 1/2-in. strips. In a large skillet, heat 2 tablespoons oil over medium heat. Add red onions; cook and stir 8-10 minutes or until softened. Reduce heat to medium-low; cook 30-40 minutes or until deep golden brown, stirring occasionally. Add remaining marinade; cook 4-6 minutes or until onions are glazed, stirring occasionally. Place red peppers on a foil-lined baking sheet. Broil 4 in. from heat until skins blister, about 5 minutes. With tongs, rotate peppers a quarter turn. Broil and rotate until all sides are blistered and blackened. Immediately place peppers in a bowl; let stand, covered, 20 minutes. Peel off and discard charred skin from peppers. Remove stems and seeds. Chop peppers; return to bowl. Add green onions, basil, garlic, salt, pepper and 1 tablespoon oil. Toss to combine. Place baguette slices on ungreased baking sheets; brush with remaining oil. Bake at 375° for 4-6 minutes on each side or until golden brown. To serve, top toasts with mushrooms, arugula, onions and pepper mixture. Bake 5-8 minutes longer or until heated through. Drizzle with aioli. Hillhurst Sunnyside Farmers' Market | Nominated for the BEST FARMERS MARKET IN YYC! Calgary. Food. What comes to mind when you hear those words? Do you think about gathering at the table around the holidays, cooking up your favourite soup in the cold of winter, going out to Red’s for brunch with friends, or going to the Calgary Farmers market? Or, perhaps you think of what Lord Cameron of Dillington calls “nine meals from anarchy” due to the fragility of our global food supply, and line-ups at the Calgary Food Bank where the 1 in every 10 Calgarians living in poverty may be supporting themselves? Everyone has their own thoughts and experiences with food since we need food to survive, but we want to challenge you to come together to help contribute to a food system that goes beyond surviving to thriving. 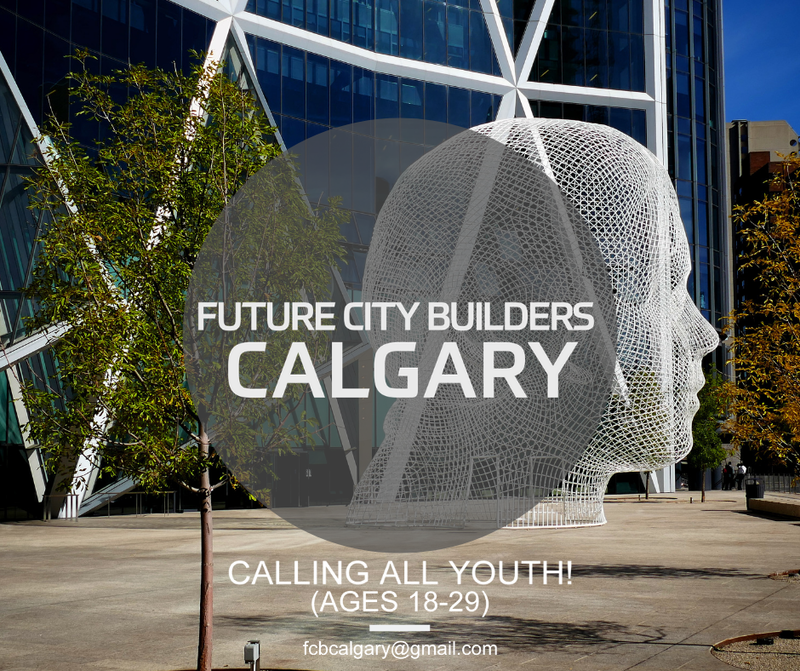 Future City Builders Calgary is an innovative, collaborative, 5-session program that will bring together 30 under or unemployed youth (18-29 years old) to build work ready skills through sharing, learning, and creating ideas around sustainable food. Everyone has their own relationship to food from growing, cooking, preserving, food waste, connecting with people through food, food skills programs, and more. It’s rare to be able to gather, share our experience as youth, and empower ourselves to come up with solutions. Our goal is to bring together the diverse voices of youth in Calgary so we can create projects that reflect the diversity of experiences of young people around food. Throughout a dynamic 5-session innovation workshop we will share our experiences and challenges with food, build skills for project planning and development through learning sessions and mentors, and create innovative ideas for taking action on food here in Calgary. It’s time for us, as youth, to come together and build the city we want. We are the future of Calgary, we can work towards a better, more equal and exciting food system, and together we can we can work to be one meal closer to peace!